The team used inexpensive DNA synthesis based on a modified inkjet printer that could deposit the materials on to a polymer chip embossed with functionalized micropillars made from cyclic olefin copolymer. 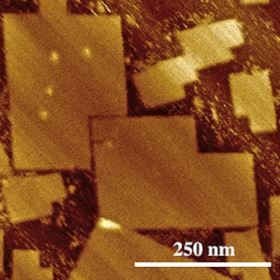 Following enzymatic amplification of the staple strands off the chip and annealing of the staples with the scaffold, they used atomic force microscopy to image the product and confirmed that they could deposit two-dimensional, asymmetric origami sheets with controlled global curvature in predictable orientations. "These origami can be customized for use in everything from studying cell behavior to creating templates for the nanofabrication of electronic components," explains NCSU materials scientist and engineer Thom LaBean. The novelty of the team's DNA origami lies in the fact that until now scaffold strands had been limited to a little over 7000 bases using M13 bacteriophage, which limits the size of any product to about 70 x 90 nm. LaBean and colleagues have used scaffold strands as long as 51 kilobases derived from a lambda/M13 hybrid virus which takes the upper dimensions of their creativity to 200 x 300 nm. "Origami structures provide functional surfaces for the specific arrangement of inorganic and organic materials with precision down to the single-digit nanometer scale," the team says. The researchers suggest that their approach could give us a reliable, large-scale, high-yield, and inexpensive DNA origami for multifunctional nanotechnology. "We will be using the 51Kb origami to organize inorganic materials into functional electronic and photonic devices, as well as organizing ligands, peptides, and proteins as nanomedical devices for communicating with receptors on the surfaces of cells," LaBean told Materials. Today. Atomic force microscopy image of DNA origami made using both the new technique (the large shapes) and the previous technique (the small ones). Image credit: Alexandria Marchi.